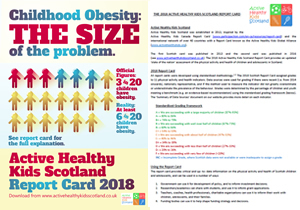 The 2018 Scottish report card has been compared to report cards from 48 countries in an International Active Healthy Kids Report Card, known as the Global Matrix 3.0 (www.activehealthykids.org), the academic papers can be found here and here. An academic publication on the Scottish grades included in the Global Matrix 3.0 is available here. 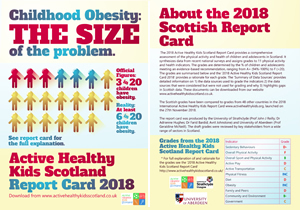 Please note: the grades for the 2018 Active Healthy Kids Scotland Report Card (summarised in the 2018 Flyer and 2018 Report Card above) differ slightly from the Scottish grades included in the Global Matrix 3.0 because the 2018 Scotland Report Card includes a) data for children under 5 years old (the age range for the Global Matrix 3.0 was 5-17 years) and b) additional indicators (diet and obesity). Active Healthy Kids Scotland published its first report card in 2013 and launched its second report card on 21st June 2016. The 2016 Report Card was produced with funding from Inspiring Scotland and The Robertson Trust. The Active Healthy Kids Scotland Report Cards are inspired by the Active Healthy Kids Canada Report Card, now the ParticipACTION Report Card (http://www.participaction.com/en-ca/thought-leadership/report-card) and the international network of around 40 countries with an Active Healthy Kids Report Card known as the Active Healthy Kids Global Alliance (www.activehealthykids.org). The 2016 Active Healthy Kids Scotland Report Card is a ‘state of the nation’ report on the physical activity and health of Scottish children and adolescents. The report card was a partnership between the University of Strathclyde (Prof John J Reilly; Dr Adrienne Hughes; Avril Johnstone), University of Aberdeen (Prof Geraldine McNeill). The Short-Form Report Card 2016 highlights the main findings. The Long-Form Report Card 2016 explains how the report grades were derived, which data sources were used to derive the grades, which data sources were considered for the report card but were not used for grading and why, links to all data sources are also provided. The Long-Form Report Card 2013 provides more detail on the methods used for deriving report card grades. A brief critique of Scottish surveillance of child and adolescent physical activity and health derived from the 2016 Active Healthy Kids Report Card process can be found here. Stakeholders from a wide range of sectors in Scotland were invited to comment on the draft grades in April 2016. The invitation to stakeholders can be found here, and a summary of stakeholders’ responses, along with our comments on these responses can be found here. Government can use it for development of policy, and to inform investment decisions. Researchers/academics can share with students, and use it to inform grant applications. Teachers, coaches, health professionals, charitable organisations can use it to inform their work with children, adolescents, and their families. Funding bodies can use it to help shape funding strategy and decisions. An academic paper on the 2016 Active Healthy Kids Scotland Report Card was published in the Journal of Physical Activity & Health in November 2016 and can be found here. 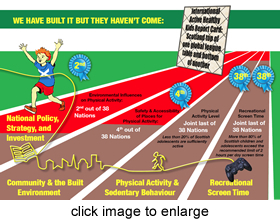 The 2016 Scottish Report Card was compared with other national report cards around the world in an academic paper published in November 2016 (which can be found here) and as part of the International Congress on Physical Activity and Public Health conference in Bangkok in November 2016 (www.activehealthykids.org). We aim to produce the next Scottish card in 2018, but need project funders and partners to do so. If you are interested in helping write or fund the next card please contact Prof John J Reilly (john.j.reilly@strath.ac.uk).